Super simple, yet impressive looking Halloween Fudge Ring. Made with milk chocolate morsels, butterscotch morsels, Oreos, candy corn and White Chocolate Candy Corn m&m’s. 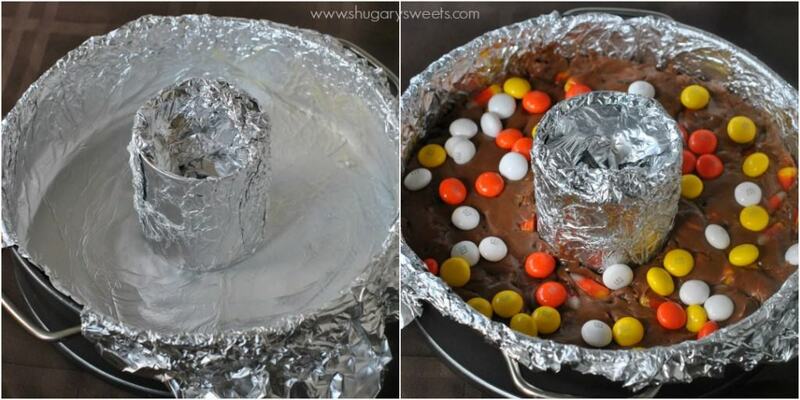 You can change it up using any candy on hand! Great use for those leftover Halloween candies. Well friends. It’s here. The month of October. The month when this mom becomes paranoid about what costume my girls will want to wear. I don’t hate Halloween (yes I do). Let me try again, I don’t hate EVERYTHING about Halloween. I just hate the costume part. I can bake for my kid’s parties. I can create some delicious stews and dinners for the night. But I am not crafty when it comes to costumes. I can’t sew. Yet, I also hate the store bought stuff. I try to encourage my girls to come up with an idea with items from their closets (mummy’s, old lady, hippie, etc…). This year, I’m thinking they are old enough to make their own costumes, right? 9 and 11? UGH. I seriously get the sweats just thinking about costume time. Have I mentioned before that they tend to change their mind about 5 times before the actual date? I would say thank goodness for Pinterest, however my replica would end up being one those “nailed it” jokes. Let’s hope they choose something simple. Like a zombie. Or a cat. Anyways, if you have any great suggestions that I can implant into their brains (without saying they are my idea of course, because then they would never say yes), let me know! Fudge. I know how to make fudge. I saw this Fudge Ring in my Christmas with Southern Living cookbook from 2007. It’s been that many years since I’ve wanted to try this recipe. It turned out super simple. I lined my springform pan with foil. I also used the empty condensed milk can and lined that with foil. I used some softened butter and “schmeared” it all over the foil. You can totally change up the flavor of this Fudge Ring by using different candies. I used the Halloween Oreos, candy corn and m&m candy corn. 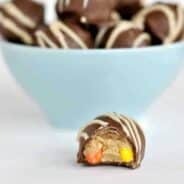 Some other great ideas would be to substitute the Oreos for Nutter Butters, substitute the butterscotch morsels for peanut butter morsels, and add in some Reese’s. Oooh, actually, I think I may try that (don’t take my idea, haha)!!! You can also just use whatever leftover candy in the trick or treat bags (not that anything is considered leftover in my house). 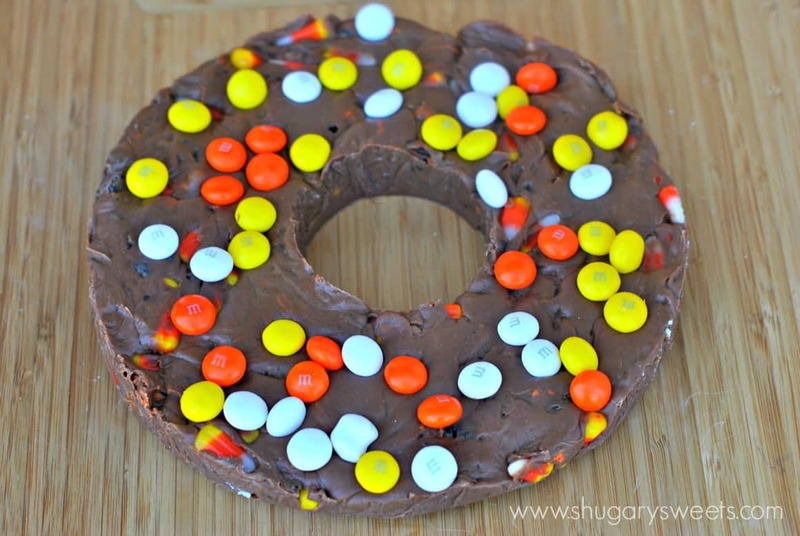 Super simple, yet impressive looking Halloween Fudge Ring. 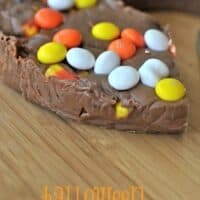 Made with milk chocolate morsels, butterscotch morsels, Oreos, candy corn and White Chocolate Candy Corn m&m's. You can change it up using any candy on hand! 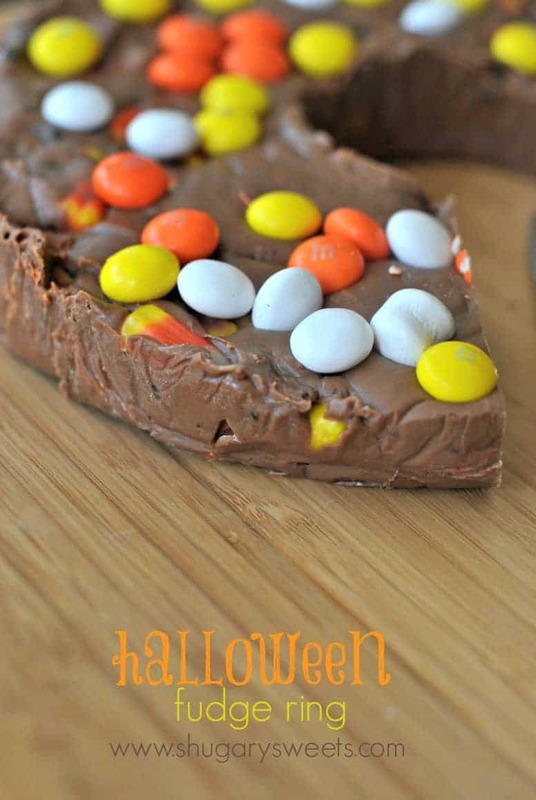 Great use for those leftover Halloween candies. Prepare your pan by lining a springform pan with foil. Wrap foil around your empty sweetened condensed milk can too. Using a tablespoon of softened butter, grease the foil. Set pans aside. In a small saucepan, heat milk chocolate, butterscotch and sweetened condensed milk over medium heat until all the morsels are melted. Stir constantly until smooth. Remove from heat. Fold in crushed cookies and candy corn. Pour into prepared pan. Sprinkle immediately with m&m's. Cover with foil and chill until firm, about 3 hours. To unmold, loosen latch on springform pan. Remove entire piece of foil. Remove can from center. 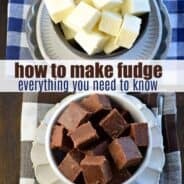 Cut fudge into slices or bites. Store in refrigerator in a covered container for up to two weeks. ENJOY. Fun idea, Aimee! And I want to try those M&Ms, like right now! What a fun Halloween dessert!! Samhain, Halloween, is my holiday! Being a Pagan witch, I love it! And I (half) jokingly say my goal is to be the crazy cat woman down the street.. one of the girls could dress in a feline style, and tow a childswagon with cats, stuffies, in it.. Cat lady! Trick or treat, noms for my babies? If one does, please post pics! A fudge ring, how cool is that? Other than the mini candy bars, I am not a huge fan of Halloween. Too many witches and devils … not my cup of tea. But fudge rings? Full of Halloween candies? Definitely my cup of tea! … or ring of fudge …. never mind. 😉 This looks delicious and I love the different shape! I love all things Spooktober!!! Mostly now I love this Fudge!!! I can’t believe we’re almost into Halloween season! Time flies. What a delicious ring you made! 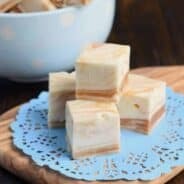 This fudge really sounds delicious with the butterscotch and Oreo cookies! Costumes — ugh. I want nothing to do with any of that business. I only stick to the food! Costume ideas: how about a favorite movie character? My daughter dressed up as Katniss from the Hunger Games for school dress up days. Black jeans, black t-shirt, hair in a ponytail, and carried a bow & a quiver of arrows. (& she won the contest, because she has a pretty good resemblance to the actress, anyway!) 🙂 Maybe your kids can enjoy ‘being’ their favorite character for the night. I’m with you on the I hate Halloween because I’m not creative and I can’t come up with an original costume ideas!!! 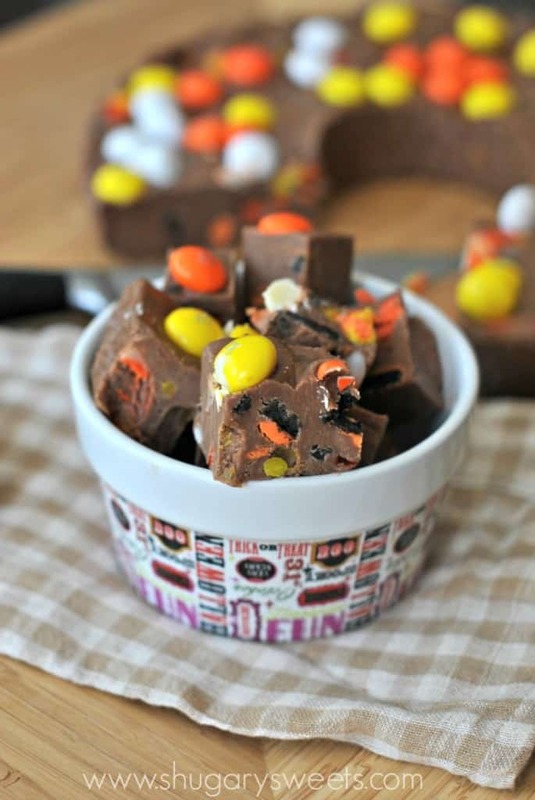 Good thing we can make sweet treats like this amazing fudge! I totally just go to the store and buy the kids a costume. I do stand around and shout “Too short! Not enough fabric! How old do you even think you are?” over and over again, but that’s totally better than me trying to sew. this is such a creative idea! I love how you did it in a bundt pan for a ring, instead of a round pan. that makes it literally easier than pie, I think. haha. I hate halloween, too. therefore I refuse to capitalize it. I am not sure of this “leftover candy” of which you speak, but I am all for fudge filled with candy! This looks like a delicious Halloween treat and so versatile (Xmas wreath version in December maybe?!) Good luck on the costume-front! Oh the trouble I could get into with this Aimee! It looks fabulous! Leftover Oreos and candy? That happens? LOL! 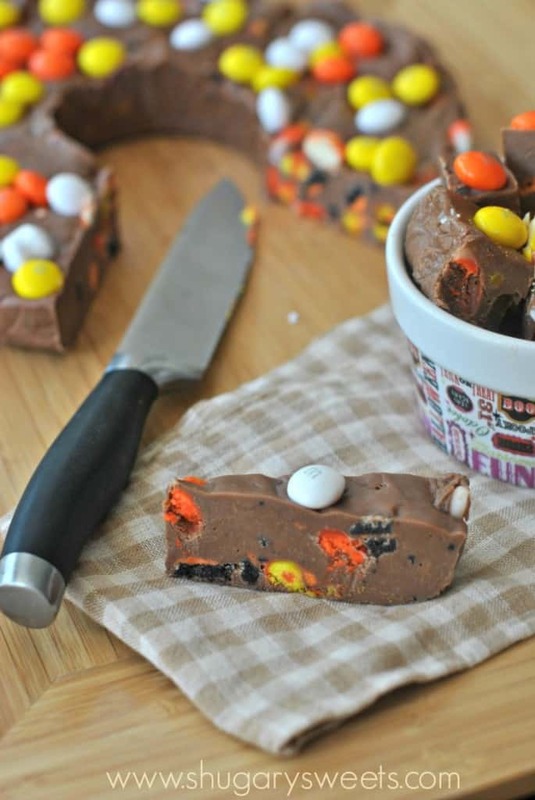 This is such a fun idea to change up fudge! I love the fun colors that are peeking out of it!!! Oh my, this recipe is dangerous 🙂 yum!! I got so lucky this year. Jordan got a used HS dance uniform at camp – and she’s wearing it. SO easy, phew! This looks SO yummy and I love that the fudge is a ring! So cute! Yum! I love the oreos and candy corn M&M’s inside. And the ring shape? Such a fun idea, Aimee! This fudge ring sounds yummy! I love that you can mix it up with different candies and colors for the different holidays! Any chance I could swap out the “butterscotch morsels” for more chocolate? We don’t have them (or anything like them, as far as I know) here in New Zealand.